changes that evoked unrest unseen since their civil war. Violence progressed to the point where all brigades were re-routed to other countries. We can’t describe the challenge that our local Nicaraguan teams have endured due to this crisis as they continue to battle every day in this new reality. Thanks to the support of our donors, we are proud to say that we are one of the few still providing health and development work in a time when our partners need us most. On behalf of our Nicaraguan family, thank you to every leader, volunteer and donor for their trust and collaboration to enable this on-going work. When one door closes another always opens. Due to Nicaragua’s political unrest, we re-opened Panama for brigades. The Panama team went from not expecting any volunteers, to receiving 627. An amazing accomplishment, especially considering the team was simultaneously setting the stage to receive one of our largest grants to date, a donation from the World Bank recognizing our economic development model as a regional leader improving economic outcomes for rural indigenous communities. Our final big news in 2018 was yet another critical move to infuse new resources into our operations and lay a pipeline for volunteers before they enter university. After 8 months of deliberation and planning, we acquired Squads Abroad, the high school equivalent of Global Brigades. Squads Abroad is enabling us to expand both our volunteer base and programmatic model to include a more direct contribution to improve education and public health outcomes in communities. Finally, we would like to congratulate team members who stepped into new leadership positions. Stephane Pillon, is our new International Logistics Officer focusing on high level safety, security and operational efficiency across all our countries. Pablo Garron is now our International Programs Officer where he will leverage his expertise in economic development to strengthen our Holistic Model and provide oversight of our Empowered 100 initiative. This enclosed report largely highlights our collective progress toward the Empowered 100. Leadership Letter (Contâ&#x20AC;&#x2122;d) 2018 marked yet another year where our talented Honduran teams led the way toward accomplishing this ambitious initiative and where we worked to finally adapt our Ghana programs to be incorporated as well. This report is dedicated to our on-the-ground teams, our movement of volunteers, our incredible donors, and the partners who have empowered this work. This is truly your organization! GLOBAL BRIGADES IS AN INTERNATIONAL NONâ&#x20AC;&#x2018;PROFIT THAT EMPOWERS COMMUNITIES TO MEET THEIR HEALTH AND ECONOMIC GOALS THROUGH UNIVERSITY VOLUNTEERS AND LOCAL TEAMS. Our Vision To improve equality of life by igniting the largest student-led social responsibility movement on the planet. Our Mission To empower volunteers and underresourced communities to resolve global health and economic disparities and inspire all involved to collaboratively work towards an equal world. Global Brigades implemented its Holistic Model or mobile clinics in more than 200 partner communities in 2018, while at the same time impacting many more nearby communities. Global Brigades ­collaborates with partner communities to implement a Holistic Model aimed at meeting the community’s healthcare, economic development, water and sanitation goals. The model e­ mphasizes community ownership and participation in their own sustainable development, eventually evolving into an Empowered Community. Economic Development BUSINESS Thriving micro-entreprises that increase household income while offering valued goods and services to the surrounding community. Access to healthcare through community health workers, regular doctor visitations, affordable medications and system for patient referrals. Prevention of disease through the construction of latrines, eco-stoves, water storage units, and concrete floors, along with community-wide public health education initiatives. MICROFINANCE Access to loans and savings programs through their community-led cooperative along with community-wide financial literacy education. In-Home Clean Water ENGINEERING AND WATER Access to sufficient clean water piped directly into homes, along with high functioning water committees to ensure ongoing maintenance. Global Brigades’ The Empowered 100 campaign will empower 100 rural communities in Central America and Africa with over 65,000 persons to permanently rise out of poverty through an approach anchored to United Nations Sustainable Development Goals #3, Good Health and Well-being; #6, Clean Water and Sanitation; and #8, Decent Work and Economic Growth. This approach emphasizes the 3 core components embedded in the Holistic Model: Healthcare, WASH, and Economic Development. Through The Empowered 100, Global Brigades aims to further refine the Holistic Model and disseminate its success for replication. 6 GOALS FOR AN EMPOWERED COMMUNITY GOAL #1* Regular, affordable access to a healthcare professional and prescription medicine. GOAL #2 Daily access to a trained community health worker. Continuous access to a clean water system + water council in place. >90% household adoption of public health infrastructure projects. Access to sufficient, affordable credit + community bank in place. At least a 1.5% annual increase of community savings reflecting economic growth. *Goals 1 and 6 have had ­substantial change in the last year. In 2018, Honduras launched a pilot phase to bring regular access to doctors and medication to Global Brigades’ partner communities. Nicaragua and Panama will begin similar pilot phases in 2019. For Goal 6, all countries will be completing research and pilot phases during 2019.
this project, only 20% of f­amilies had a ­properly functioning latrine in their home. During this time, Global Brigades (GB) ran mobile medical and dental clinics in La Corneta at least twice per year. In 2017, one more large step was taken, with the establishment and training of a Community Bank in La Corneta, which was ­capitalized and began ­disbursing its first loans in 2018. The existence of the Community Bank allows families to seek improved solutions to their economic challenges through savings and loans services. a new water system and public health projects in the community. Families from El Jiote began attending Medical Brigades in nearby San Bernardo in 2017, and in 2018 the water and public health projects were completed. In the final months of 2018, GB technicians established and trained a new Community Bank in El Jiote, and are preparing to train a group of Community Health Workers in the first quarter of 2019. El Jiote is an excellent example of the increased impact GB can have when partnering with local organizations like FUNDESUR. program held a pro-bono legal clinic in the community in 2016 providing 22 legal consultations to community members. The Panama medical team worked throughout 2017-2018 to help resolve a patient referral case in La Peñita, and is currently training a Community Health Worker. Of our Panamanian partner communities, La Peñita has one of the most dire circumstances regarding access to water. To resolve this, in 2018, GB completed a detailed assessment of the situation, working to identify potential water sources. We look forward to completing the design and construction of a water system for La Peñita in 2019.
leaders of of Ekumpoano have shown great initiative to collaborate with the local GB team to start the Public Health program in Ghana for the first time, in their community. GB Ghana will continue to work with our local partners to improve access to clean water and financial services in the community as part of our Holistic Model programming. Donor Spotlight MERKEL FAMILY The Merkel Family has had a long and g ­ enerous history in donating to sustainable impact in developing communities. After having supported Marquette University student volunteers for many years, the Merkel Family was connected with Global Brigades and a new partnership was born from the family’s interest in contributing to GB’s strategic initiative to eradicate rural poverty in 100 partner communities, The Empowered 100. GLOBAL BRIGADES IS PROUD TO HAVE A SUCH A STRONG PARTNER IN THE MERKEL FAMILY WHO ARE COMMITTED TO FURTHERING THE IMPACT THE ­HOLISTIC MODEL CAN MAKE AROUND THE WORLD. Obtaining health and dental care is one of the largest challenges for our partner communities. Hospitals and clinics are scarce in the rural areas where we work, and those that are accessible often lack sufficient staff, equipment and medication. The situation is further exacerbated by the economic obstacles faced by community members when seeking healthcare. These factors often leave families with undiagnosed and untreated ailments. GB’s experience in ­implementing healthcare programs in rural communities has led us to believe that “Access to Healthcare,” at a minimum, must include access to a healthcare professional and necessary medicine, at a location and cost that meets the capabilities of the families we work with, in addition to a Community Health Worker that has been trained to attend basic health and emergency needs of the community. Goals #1 and #2 of the Empowered 100 campaign were developed based on this idea. Medical Our Medical Program contributes to the Holistic Model through the implementation of mobile clinics and training Community Health Workers. In collaboration with local governments, and community leaders, each partner community receives 2-3 mobile clinics per year through the support of local doctors and international volunteers & healthcare professionals. Patients receive access to medical & dental consultations, medications, and preventative education. Throughout the year when mobile clinics are not available, community members access healthcare through our locally trained Community Health Workers. Medical Brigades volunteer sorting medication for a mobile clinic. Through December 2018, 4 of the 100 target communities have began piloting GB’s Healthcare Professional Access Program. Through December 2018, 56 of the 100 target communities have fully established and trained Community Health Workers. Alumni Brigades in Honduras In 2018, Global Brigades hosted its first Alumni Brigade in Honduras, a Medical Brigade for healthcare professionals. Licensed healthcare volunteers worked alongside our local medical teams and trained Community Health Workers to implement a mobile clinic and provide specialized care to patients. Chronic patients in the community of Tomatin, Cantarranas, were seen by the brigade, and for the first time a Paperless Patient Data system was piloted. This new program builds upon the work of GB’s undergraduate volunteer movement with a more focused healthcare system for Empowered Communities that have completed the Holistic Model, but seek ongoing access to doctors. Community Health Workers in Nicaragua As part of the Empowered 100 initiative in Nicaragua, and in an effort to improve access to healthcare in our partner communities, in 2018, the local team launched a program aimed at reinforcing the already existing network of CHWs in the country. The objective is to build local capacity in health prevention, education, and risk reduction. In collaboration with the local government of Estelí, in 2018, the first phase of training focused on maternal mortality and premature births, in alignment with the UN Sustainable Development Goals. In 2018, the GB Panama team began c­ ollaborating with Medic Mobile, an organization whose mission is to improve healthcare access in the most difficult to reach areas of the country. Medic Mobile’s software supports health workers to provide a higher quality service to a greater number of people. The software, which forms part of a Community Health Toolkit, improves distribution of medication, hastens disease outbreak follow-up, facilitates door-to-door care, emergency communication, and more. GB Panama and Medic Mobile signed a cooperative agreement to launch the implementation of the software for the first time in Latin America, with the objective of piloting the project with GB’s Community Health Workers in 20 communities. Medical Brigades volunteer in the dental station during a mobile medical clinic. To support the medical care provided during mobile clinics, our Dental program provides emergent and preventative dental care procedures to patients by licensed dentists. During the dental station, community members will have access to fluoride treatments, cleanings and extractions, as necessary. Educational workshops are also provided to encourage healthy dental care habits. GLOBAL BRIGADES Dental units on brigades in Panama One of the newest characteristics of Medical Brigades in Panama is the addition of portable dental units in all of GBâ&#x20AC;&#x2122;s mobile clinics. This has increased the ability to meet the demand of patients for teeth cleanings. Having the ability to do these types of procedures as a component of our dental program means that we are no longer only doing invasive, reactionary care, but now able to do preventative care, which helps to improve oral health habits in the our partner communities. As part of The Empowered 100 and GBâ&#x20AC;&#x2122;s effort to involve more communities and families in the Health Care Professional Access program, dental cleanings were included as a service provided to patients that sought medical attention during the implementation of pilots in the communities of El Resbaloso and El Junquillo, Honduras. Prioritizing restorative care The Dental Program emphasizes the importance of restorative care, and prioritizes restoration in the place of extractions whenever possible, with the goal of contributing to the integrity of the oral health of the patients we attend to. In Nicaragua in 2018, 60% of patients received restorative care, representing a 14% increase from 2017. We aim to continue increasing the focus on preventative and restorative care. Economic resources and o ­ pportunities can be scarce in GB’s partner communities. The lack of access to financial services, capital, and financial literacy education acts as a barrier to economic growth for families and rural businesses. These factors, combined with higher than average interest rates, exploitative intermediaries, and volatile agricultural conditions, often leaves families trapped in a cycle of poverty. GB’s experience working with ­community members and small business owners has led us to believe that “Economic Development” for our partner communities should start with local access to affordable financial services in the form of a Community Bank. From there, GB can work with individual entrepreneurs to utilize these services and grow their businesses. Moreover, evidence demonstrates that a measurable increase in savings is directly related to the economic growth and stability of a family. Goals #5 and #6 of The Empowered 100 were developed based on these ideas. Business Our Business program is the backbone of our Holistic Model. It consists of four core components: creating and strengthening Community Banks, increasing family income, fostering a culture of savings, and ensuring access to capital for low-interest loans. Through December 2018, 78 of the 100 communities have a Community Bank established and trained that provides access to affordable credit to community members. In 2018, GB finalized it ­definition of Goal 6 for an Empowered Community as “At least a 1.5% annual increase of community savings reflecting economic growth.” We look forward to begin measurement of this goal in 2019. In April 2018, to increase access to loan capital for Community Banks, Global Brigades became an official Kiva partner in Panama. Kiva loans specifically provide capital to indigenous communities and vulnerable women in rural areas. Loans are used to invest in small businesses to increase productivity and revenue, with interest remaining in the community bank as capital gain. Since the partnership launch, $34,400 has been lent through 27 loans. About 75% of the loans have been repaid with 0% default, with the Kiva average at 1.58%. Similarly, the delinquency rate of GB’s Kiva loans is at 0%, and contrasts with Kiva’s average of 10.58%. The average time to fund our loans on Kiva was 0.3 days versus the 7 day Kiva average, and 96.3% of these loans were borrowed by women. Despite the disruption caused by political unrest in 2018, the GB team in Nicaragua continued their hard work training and capitalizing Community Banks. Six new Community Banks were established in 2018, bringing the total amount to 15. With ongoing technical assistance from GB, the Community Banks encourage a culture of saving and access to loans with competitive interest rates. Nine of the 15 banks in Nicaragua have a collective 0% default rate, and 56% of loans have been disbursed to women. Café Holistico in Honduras Café Holístico is a Global Brigades initiative that works with partner communities in Central America to build capacity of coffee farmers. With technical support in Honduras, coffee producing communities have grown from having to sell coffee beans in their raw, wet form, to now selling them already dried. This is accomplished by building coffee drying beds, incrementing the sales price of beans, and generating more income for farmers. Prior to constructing drying beds, community members in El Jute sold their coffee at around $37/sack. That price more than doubled to $86/sack once they were able to start selling dried beans. Access to clean water, sanitation, and best practices in hygiene (WASH) is fundamental to human health. It is common for our partner communities to lack these vital resources leading to families suffering from preventable diseases. Not only can this result in serious medical complications and even death in certain demographics, but the situation can also contribute to stalled community development and prolonged economic hardship. GBâ&#x20AC;&#x2122;s experience developing WASH solutions in rural communities has led us to believe that access to proper â&#x20AC;&#x153;Water, Sanitation and Hygieneâ&#x20AC;? starts with a balance of infrastructure, education, and community buy-in. For an improved quality of life and reduced risk of preventable illness, community members should, at a minimum, have access to clean water, a functioning toilet and the infrastructure to facilitate best practices in sanitation and hygiene. Goals #3 and #4 of the Empowered 100 campaign were developed based on this idea. Water & Engineering While community members are aware of the Â­obstacles faced for obtaining access to clean water, the technical expertise to identify, design and implement solutions is often absent. Engineering Brigades brings volunteers, local engineers, and community members together to assess, design and budget water infrastructure solutions. Once a water system is designed, the Water Brigades program breaks ground on its construction. The implementation of the project is a collaborative effort between community members, volunteers, local government, partner organizations, and the Global Brigades team. Upon completion, each family in the community has a water connection on their property, delivering to them the necessary quantity of treated, clean water that they need for consumption and proper hygiene and sanitation practices. EMPOWERED 100 GOALS Goal #3 Through December 2018, 58 of the 100 communities have a clean water system and trained Water Council in place. 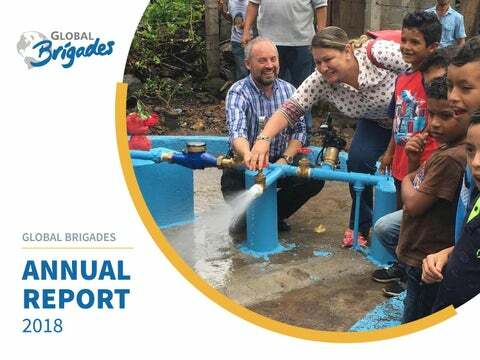 In Honduras, Global Brigades has constructed 29 water systems serving 34 partner communities. Equally as important, each of those water systems is maintained, operated, and administered by a trained Water Council. One of the Water Council’s functions is to collect a monthly water fee from beneficiary community members in order to ensure the long term sustainability of the system. GB trained Water Councils in Honduras currently have a collective total of over $67,000 in savings, allowing them to repair and expand their systems when necessary. While the Ghana Water Company produces sufficient volumes of water to supply all of GB’s partner communities, many are still unable to access this water due to the costs involved in the transmission and distribution to the communities. To address this, GB Ghana has developed partnerships with the Ghana Water Company and the Community Water and Sanitation Agency, who provide design and technical expertise while GB is able to grant funds to be invested in extending clean water infrastructure to communities. To further supplement this effort, in 2018, progress was made through a partnership with the Lions Club in the UK to fundraise a sum of £4,000 of the £10,000 goal to support the expansion of piped water to the community of Immuna in the Ekumfi District. Water in Las Cureñas, Nicaragua The community members of Las Cureñas, Jinotega, in Nicaragua, worked arduously for over 10 years seeking support to improve the water situation in their community. Their efforts were met only with obstacles and denials. Families collected untreated water from public, hand pumped wells, rivers and streams and carried it in containers back to their homes to meet the most basic needs. In 2018, community leaders contacted GB to collaborate with them on a water system project, and the rest is history. The new water system in Las Cureñas draws water from a drilled well, to a new 6,000+ gallon storage tank from which water is distributed 24 hours a day to the entire population. Public Health The lack of basic in-home public health infrastructure and education on best practices in sanitation and hygiene in our partner communities contributes to the cycle of health Â­challenges and obstacles in development that families experience. Our Public Health program aims to address this by supporting the Holistic Model with the development of in-home infrastructure, and hygiene & sanitation education. Public Health Brigades volunteers working on a hygiene station infrastructure project with a local mason. EMPOWERED 100 GOALS Goal #4 Through December 2018, 22 of the 100 communities have over 90% in-home coverage of public health infrastructure projects. While masonry is traditionally an occupation for men in Honduras, that didnâ&#x20AC;&#x2122;t stop three women in the community of Chandala, where GB worked, to implement Public Health projects in 2018. Rosa Cubas, Julissa Soto, and Wendy Rodriguez, community members of Chandala, showed the initiative to learn and the desire to have a new opportunity for employment. They underwent training on how to construct an eco-stove, completed 17 in the community, and are prepared to continue replicating their new skills in 2019. GB technician, Joaquin Zuniga, is already replicating the model, training 15 more women masons in the communities of Cerro Bonito and Suyapa. Global Brigades Ghana began implementing its Public Health program in 2018. The objective of the program in Ghana is to eliminate open defecation by constructing household toilet facilities, and facilitating improved sanitation and hygiene education for the populations of our partner communities. The model encompasses the installation of household biodigester pour flush toilet facilities constructed by brigade volunteers with assistance from local masons during brigades. The first toilet project was implemented in the community of Ekumpoano, in the Ekumfi District of the Central Region, in 2018. Prior to the commencement of the program, residents in Ekumpoano had only one Kumasi Ventilated Improved Pit (KVIP) toilet. The KVIP toilet which serves the entire population of Ekumpoano had very few private rooms for both males and females. Lack of toilet facilities in the community and the fact that people had to join long lines to defecate compelled defecation in the open along the beaches, bushes, in polythene bags and immediate surroundings, exposing them to high public health risks including outbreak of cholera, diarrhea, as well as other water and sanitation related diseases. Solid waste treatment innovation in Nicaragua In 2018, the Nicaragua WASH team took the initiative to implement an innovative design upgrade to the Sanitation Unit (latrine, bathing area, water storage) installed by the Public Health program. To improve solid waste treatment and disposal of the latrine, a self cleaning biodigester was installed, replacing the previously used simple septic pit. Upon positive reception from partner communities, the change was adopted for all new projects. The biodigester performs primary and secondary treatment of wastewater, lowering risk of soil and water table contamination. GB hopes to explore similar upgrades with its Public Health programs in all countries. Educating and Â­empowering leaders in our partner communities is essential to the successful implementation of the Holistic Model. Initiatives aimed at increasing gender equality, economic and health knowledge and practices, and legal empowerment are an integral part of Global Brigades programming. Legal Empowerment Many families in our partner communities suffer from a lack of access to basic legal services and knowledge regarding legal procedures and their rights. Reliance on verbal agreements and poor record Â­keeping can result result in unresolved legal issues, often adding additional economic strain to an already resource strapped population. To mitigate the effects of these barriers to justice, the Legal Empowerment program implements three program activities: pro-bono legal clinics, family law cases, and Â­educational workshops. Legal Empowerment launched in Honduras In 2018, the Legal Empowerment program was implemented for the first time in Honduras. The program was developed to fit the specific context in rural Honduran communities while utilizing many of the lessons learned from years of program execution in Panama. The first Legal Empowerment program in Honduras visited the community of El Espinito, in El Paraiso, in May 2018. Partnering with local universities Global Brigades’ Legal Empowerment program initiated partnerships with the University of Panama and the Central American Technological University (Honduras). Panamanian and Honduran law students now accompany the GB team and brigade volunteers when implementing legal clinics and working to resolve family legal cases in our partner communities. This will to not only create more impact in the community but also potentially lead to strengthened relationships with local authorities, community leaders, and other universities in the region. Womenâ&#x20AC;&#x2122;s Empowerment Global Brigades believes that investing in and Â­empowering women is fundamental to the success and sustainability of projects and the continued development of our partner communities. Each of our programs work in a unique way to educate and empower women to take on leadership roles in their communities. Community Health Worker Conference In 2018, Global Brigades held two Community Health Worker Conferences in Honduras. During the day long event in each region, CHWs from communities participated in skill building sessions and hands on practice with local and foreign healthcare professionals. NY-VT Nurses Unite hosted their first conference in the central region, and University of Toronto expanded their impact with the first CHW conference in the southern region of Honduras. Community Bank Empowerment Summit Global Brigades Panama hosted their 4th Annual Community Bank Empowerment Summit in February 2018, with the theme of the event being “Strengthening Financial Leadership”. The executive boards of all 20 Community Banks in Panama attended the summit, alongside representatives from a number of other organizations working in the region including: United Nations Development Program, National Coordination of Panama’s Indigenous Women, the US Embassy, and Panama’s Ministry of Government. Global Brigades strongly values financial transparency and the ability to share our budgets with our donors and volunteers. Each year, we strive to utilize funds raised to expand our model to more communities and with increasing sustainability. In 2018, we raised more than $13 million dollars, with only 18% utilized for our operational and fundraising costs. 82% of the funds raised were utilized for our programs. Each Global Brigades entity in USA, Canada, Honduras, Panama, Nicaragua, and Ghana undergoes an independent audit. The financial figures shown below are combined numbers for January 1, 2018 thru December 31, 2018 for USA, Canada, and UK. Global Brigades’ revenue is earned as it’s received by donors and chapters. However, those funds are held as temporarily restricted until each applicable brigade (if the funds were raised in conjunction with a brigade) happens on-the-ground. Global Brigades’ deficit in 2018 was mainly due to the loss of donations from the stop of brigade operations in Nicaragua mid-year. Allocation of Program Expenses Funds are granted to our program entities in Honduras, Panama, Nicaragua, and Ghana to execute our initiatives in healthcare, WASH, and economic development. In addition, our program impact also includes the global leadership development of our student leaders. Allocation of Operating Expenses We strongly believe in empowering our local teams to hire local staff in each of our program countries. We have a small team of non-local staff living in Honduras, Panama, Nicaragua, and Ghana that live on-the-ground to support the preparation of our volunteers and impact of our programs. Based on this model, we are able to forgo needing a costly headquarters in the United States. Our student chapters are the leaders behind the fundraising for Global Brigades. Our fundraising expenses are mainly focused on ensuring our chapters have the tools to effectively fundraise using our online platform. Weâ&#x20AC;&#x2122;ve also started to invest more in grant seeking from other large donors. Thank you to our Board Members, Campus Chairpersons, Chapter Presidents, Brigade Leaders, volunteers, and donors who work with us to achieve our mission alongside our community partners. Itâ&#x20AC;&#x2122;s your passion and generosity that make this impact possible. 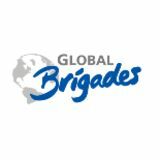 Global Brigades is mainly financially supported through the funds that Global Brigades Chapters raise. IN 2018, 281 CHAPTERS SUPPORTED US TO FURTHER OUR HOLISTIC MODEL AND MEET THE GOALS IN OUR EMPOWERED 100 INITIATIVE. GLOBAL BRIGADES 2018 Universities, Campus Chairpersons (note: not all universities have a Campus Chairperson), Chapters, and number of 2018 volunteers per chapter. Maggie Dyszlewski MARQUETTE UNIVERSITY PUBLIC HEALTH BRIGADE JANUARY 2018 NICARAGUA â&#x20AC;&#x153;The experience I had with Global Brigades is something I will hold onto for many years to come. Of many lessons I learned during the experience, the one main thing that I took away was the importance of conversation especially in situations where there is a language barrier. I think going on Global Brigades can give just about anyone a new perspective or outlook about just how much education about health and disease prevention can go a long way in promoting happier and healthier lives for people with unfortunate circumstances. As much as going on Global Brigades gives us an opportunity to teach others, I feel that as a volunteer there is so much more that we can learn from the community members whether that is known by the members or not.â&#x20AC;? Valentina Garcia FLORIDA INTERNATIONAL UNIVERSITY DENTAL BRIGADE MAY 2018 NICARAGUA â&#x20AC;&#x153;It is nearly impossible to put into words what I have experienced in just seven short days with Global Brigades Water. My heart is so full due to the amazing staff, community members and other brigaders that I worked alongside. There is no other way to describe our relationship other than to liken it to family. We have a unique bond now, having laboured for the same project and the same goal. We are linked by the work we did and the emotions we shared. This brigade may have involved some of the most strenuous manual labour I have ever done. However, with the amazing spirits of all of those around me, at the time, I had nothing on my mind except to keep going. Water is a basic human right and need, and in the developed world, we are lucky to never question our access to clean water. It seems so unfair for others around us to spend every day wondering when they will receive this dream. In the community of Los Terrones, the journey has been long, but I am so excited to see it coming to an end soon. I know I will be shedding tears of happiness when I finally hear that the taps are being turned on. That being said, I know it will not even come close to the feeling of relief so many in that community will be feeling. At last parents will no longer have to worry about their kids not having water to drink. Coming home, I feel a sense of empowerment.â&#x20AC;? Microfin Rural Bank Limited Rural Enterprises Program National Health Insurance Scheme, Saltpond. How Will you Make an Impact With us?